A Section 8 Company is an organization which is registered as a Non-Profit Organization (NPO). NPO/company has its objective of promotion of arts, commerce, charity, education, protection of environment, science, social welfare, sports, research, religion and intends to apply its profits, if any, or other income in promoting its objects. It functions exactly like a limited company including all the rights and obligations that come with such a company. However, it differs from a company in one very crucial aspect, i.e. it cannot use the words “Section 8” or “Limited” in its name. The income of the Company must be used to promote only charitable objects and cannot pay any dividend to the members of the company. The central government provides an incorporation certificate to all such companies and also informs them about some restrictions and conditions. In case they don’t fulfil them, the central government may also order them to wind up the company. In case fraud objectives of the Company are proved, legal action will be taken against all officers of the Company.Section 8 Company Registration can be done through LegalRaasta in Delhi NCR, Mumbai, Bengaluru, Chennai and other Indian cities. Then, we shall obtain DSC and DIN for directors and apply for name approval of company. Details provided by you for Section 8 registration will be verified by our experts. We will apply for license and also obtain certificate of incorporation for Section 8 and then apply for TAN and PAN. Once your Section 8 company is registered, we shall send you TAN and PAN via courier. What is Section-8 Company ? In India, a non-profit organisation can be created by registering a Society under the Societies Registration Acts or registering a Trust or incorporating a Section 8 company with a not for profit motive. Section 8 under the Companies Act, 2013 corresponds to the old Section 25 under the Companies Act, 1956, which was popularly known as “Section 25 Company”, hence the name “Section 8 Company”. First of all, the partners have to apply for Digital signature and DPIN. Digital signature is an online signature used of filing and DPIN refer to Directors PIN number issued by MCA. If the directors already have DSC and DPIN, then this step can be skipped. You to provides 3 different name options to MCA of which one will be selected. Names provided should ideally be unique and suggestive of company business. The Registrar of Companies may require the applicant to furnish the approval or concurrence of any department,regulatory body, appropriate authority, or Ministry of the Central or State Government(s) in relation to the work to be done. After the company’s name is approved, one needs to apply for a Section 8 Company licence from the MCA.The Registrar will wait for 30 days for objections, if any, of any person pursuant to notice published in newspapers.The Registrar might also consult any other regulatory bodiesandnecessary authorities. Thereafter, the Registrar of Companies may,at its discretion, grant the licence with or without certain conditions. The Registrar may direct the company to insert in its memorandum, or in its articles, or partly in one and partly in the other, such licencing conditions as may be specified by the Registrar in this behalf. Once the licence is obtained, one needs to draft Memorandum of association and Articles of Associate. But the object of the company must always be a charitable object. Both MOA and AOA are filed with the MCA with the subscription statement. It typically takes 15- 25 days to form a Section 8 company and get the incorporation certificate. The Certificate of Incorporation is proof that a company exists. It also includes your CIN (Company Incorporation Number).The Registrar will wait for 30 days for objections, if any, of any person pursuant to notice published in newspapers.The Registrar might also consult any other regulatory bodies and necessary authorities. Thereafter, the Registrar of Companies at its discretion, may grant the licence. And such licence may contain conditions as deemed necessary by the Registrar. The name of your Section 8 Company is very important. Your Section 8 Company’s name is the first impression to your buyers, suppliers and stakeholders. It should therefore be attractive, relevant and suggestive. There are several factors that you should keep in mind while choosing a name for your company. The name of your Section 8 Company should be relevant to your business. It should fit the company’s branding strategy. For example, Infosys refers to information systems or IT technologies. Name of your Section 8 Company should not be exactly the same or identical to an existing LLP or company or trademark or for which a trademark has been applied for. You can go to search.legalraasta.com to check if your company name matches any others. Ideally, you should avoid plural version e.g, “Snapdeals” or merely changing the letter Case or punctuation marks or spacing in an existing LLP, Company and Trademark name. Your Section 8 Company’s name should not be given under and violate the Emblems and Names (Prevention of Improper use) Act, 1950. Click here to check the names. (See the Schedule). 1. Is it necessary to have 2 directors for Section 8 Company Registration? 2. Who can become a member in Section 8 Company ? 3. For incorporation of Section 8 Company, do I have to be present in person? 5. Time taken by LegalRaasta.com in forming a Section 8 Company? LegalRaasta.com can incorporate a section 8 Company in less than 20 days. The time taken also depends on relevant documents provided by the applicant and speed of approvals from government. To ensure speedy registration, please pick a unique name for the proposed Company and make sure you have all the required documents prior to starting the registration process. 6. Is it necessary to have a charitable object to register a Section 8 company? Yes, it is necessary to have a non-profit motive to incorporate a Section 8 company. 7. What is the life span of the Section 8 company? 8. In which cities does LegalRaasta incorporate Section 8 Company? LegalRaasta provides Section 8 Company incorporation services across India in all cities. 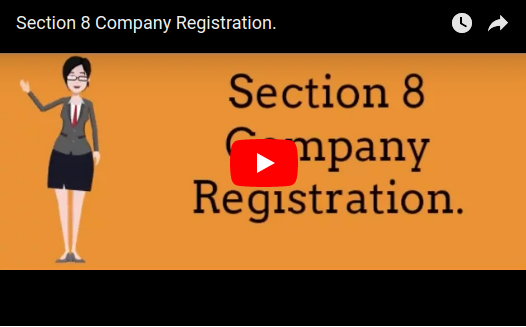 We have done Section 8 company registration in Mumbai, Delhi, Gurgaon, Noida, Bangalore, Chennai, Hyderabad, Ahmedabad, Kolkata, Surat, Pune, Jaipur, Lucknow, Kanpur, Nagpur and other Indian cities. 9. Why should I choose LegalRaasta for Section 8 Company registration? Legalraasta.com is one of the best online service portals to help register Section 8 Companies in India. We have 10 years of experience in application of Section 8 Company registration. LegalRaasta has 30+ regional offices in India and expand its network in India with 2000+ customers for Section 8 Company.